Our next major update is scheduled for March 26th. The Arks Unity Festival boost reward period will end on March 19th’s Maintenance. PSO2 Deluxe Package releases on March 20th. Visit the Deluxe Package post to see a list of all available items. A new interrupt event has been added! Client Order NPC アリス (Alis) has been added to the game. Clear EP1 Chapter 10’s story quest to receive her client orders, but first, head to the camp ship. A partner card for アリス (Alis) has been added. 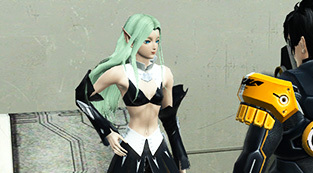 Added new color variation costumes for アークスバッヂ黄 Yellow Arks Badges. バッヂ交換ショップ２Badge Exchange Shop 2 is now available. アークスバッヂ緑 Green Arks Badge exchange items have been added. Corrected a bug that displayed the names of items that either did not exist or can’t be displayed in My Shop for the [keyword prospect search] function. Objective: Speak to Arks Members of each class. Notes: Speak to Oza, Risa, Marlu, Azanami. Notes: Speak to the NPCs again if they’re handing out items. Objective: Speak with the female ARKS members in the shopping area. Notes: Speak to Patty, Tiea, Aki, Io, Fourie. Objective: Speak with veteran ARKS members in the gate area. Notes: Speak to Barbara, Klotho, and Jozsef. Prereqs: Make sure you have Barbara, Klotho, and Jozsef’s CO unlocked. Objective: S-rank Clear an Advance Quest without a partner character. Objective: Clear a Time Attack Quest on Super Hard or Higher with Alis only. Objective: Clear a Tundra and Mechs Extreme Quest with Alis only. Objective: Clear an Extreme Quest without a Partner character. If you are using your personal Google Calendar account, please refresh the page to receive the latest updates. If you are using a mobile device or an external application, you must [sync] the calendar after maintenance has ended. +50% Rare Drop/Meseta Boosts for All Quests! The boost is in effect from 0:00 ~ 23:59 JST on the appointed day. Between 3/21 ~ 3/24, all Super Falz emergency quests will achieve +250% Rare Drop Boost! Clear Alis’ client orders to receive various prizes! Obtain the following matter boards by the end of the campaign period to receive a number of prizes. Matter boards obtained prior to the start of the campaign will also qualify. If you do not log in during the campaign period, you will not qualify for the prizes.